G. E. Bentley, Jr., ed. William Blake’s Writings. Oxford: Clarendon Press, 1978. Vol. I, lvi + 745 pp. ; Vol. II, ix + 1080 pp. £ 65.00. Reviewed by E. B. Murray. Blake’s Writings is the natural yet transcendent culmination of the monumental trilogy which Professor Bentley has been constructing for us since he began his work on Blake some twenty-five years ago. As the capstone to a library cromlech otherwise comprised of Blake Records (1969) and Blake Books (1977), it inevitably participates a good deal in the essential matter of the double pillars which support it, and, as Bentley suggests, is meant to be supplemented by them when economies of time, space, and editorial policy curtail bibliographical description and certain annotative and referential materials. The editor’s primary purpose here has been to “present Blake’s writings in a form as close to his originals as type will permit.” Volume I contains the engraved and etched writings, with all (or nearly all) significant illuminations reproduced in black and white. Volume II contains all writings in conventional typography and in manuscript, including the letters and marginalia. The Introduction includes a brief account of previous important editions, statements of purpose and editorial methods, and is followed by comparably brief accounts of the printing and coloring of the illuminated works. Typically, the Bibliographical Notes for each illuminated work provide information about date, publication, coloring, catchwords, order, significant variants, errata, and copytext, with ad hoc notices of running heads, designs, and plate sizes, as they seem necessary or helpful. The Notes for the writings in conventional typography and in manuscript vary considerably according to the demands of the text described, but generally include location, watermark, leafsize, date, and description, with specific notice as needed of copytext, page and line numbering, design, running heads, full title page, collation, press figures, catchwords, corrections, ornaments, stab-holes, and order, while certain works are provided with selectively expansive commentary: Vala’s dating, description, and variant handwriting; the Notebook’s designs, description, and location. Supplementary materials include a chronologically arranged table of contents which locates both texts and corresponding bibliographical notes, a list and description of lost works, a list of the source and location of each plate reproduced, an alphabetized list of present-day locations of contemporary copies of Blake’s writings, tables of ambiguously broken words, of repeated lines and designs, along with keys (maps) to Blake’s London, Britain, and Holy Land, and a preface containing about sixty addenda and corrigenda, which selectively update through 1967 a text that went to press in 1971 and achieved its galley-proof definition in 1974. In the body of the text each illuminated work is provided with brief footnotes describing the design, variants in different copies (repeated in the Notes), as well as cross references, verbal changes, and identifications of people and places (usually historical or biblical). As a rule, the design descriptions are physically representative and conservative rather than symbolic and expansive, while the informational notes are relatively lean when compared with, say, those in the Longman Complete Poems. Volume II does not categorize its notes in the same way, but it provides, when apt, essentially the same kind of information. With a few exceptions, the design reproductions compare favorably with those in The Illuminated Blake, though one may feel Bentley has omitted some plates significant enough for reproduction, and one may lament the fact that it was apparently necessary on begin page 149 | ↑ back to top occasion to divide the top and bottom designs on a given plate by placing them on successive pages. While the notes make no attempt at variorum inclusiveness by providing a history of editorial readings and misreadings, they do often (though perhaps not often enough) retail the textual recoveries and alternative readings of David Erdman, at times with a hint or statement that the Erdman eye has seen what Bentley does not believe is strictly there to be seen. While there is still some disagreement about a very small number of substantive readings in Blake’s illuminated works, the fact that for virtually all their extant impressions there was in the beginning only one (lost) archetypal source—the original copperplates—means that, except for a few notorious scratchings out and maskings over and even fewer verbal alterations, there is little question about the words of Blake’s text from copy to copy, nor is there likely to be, even when a substantive (e.g., Thel’s “Mne” and “o’erfired”) balks all effort at extracting any definitive sense from it. Perhaps Bentley or Erdman or another keen-sighted adept in Blake and in mechanical aids to perception will recover an erasure here and a blot-out there—or perhaps rectify a word or two on the basis of relevant collations—but diminishing returns from this much-gleaned field may hardly seem to repay the scholarly effort at work in it. The continuing uneasiness which must afflict the conscientious editor as he moves from impression to impression of a given copperplate will most likely be inspired by the punctuation. At first glance, several reproductions from a single archetype may seem to provide an editor with the maximum opportunity for a punctilious fidelity to an author’s text but, in this instance, wind up providing him with a minimum temptation to take advantage of it. What abstractly considered seems to represent an ideal combination of author, illustrator, printer, and publisher—a veritable fourfold vision of a canon from its conceptual origin in Eden to its empirical dissemination in Ulro—disorganizes into a mere chaos of variable signs and inferences, chance associations, and contextual guesswork which not only makes a given editor (and his readers) the victim of the impression he chooses to rely on but threatens besides to invite the spectre of deconstructionism into the very sanctum of bibliographical objectivity by making every editor his own copytext, at least insofar as it matters what impression he decides to call his copytext. While times and expectations have changed since Geoffrey Keynes could tell us that he was redeeming Blake’s text from the multitudinous accretions of error piled on it by previous editors in providing a thoroughly accurate text which, in effect, ignores Blake’s pointing, it is not yet certain that times and expectations have therefore changed for the discernible better. How far beyond varying kinds and degrees of editorial ignorance have we moved, and can we move, when we find both Erdman and Bentley in fundamental agreement about one major premise at least—that there is no telling from copy to copy whether a given point at a given place in a given work by Blake is a comma or period, or, by logical extension, a semicolon or a colon? The fact that the problem is compounded beyond a given editor’s choice of copytext may be briefly highlighted by noting the different pointing inferred from the unique copy of The Book of Los by Erdman (E) in his “diplomatic” text (1965) and by Bentley (B) in this present “reconstructable” one. That is, E reproduces the pointing (or lack of it) as he reads it from the impression(s) he uses; B provides italics and half-brackets to indicate where he departs from the pointing in his copytext. (I assume throughout that B relies on his copytext even in accidentals unless he tells us otherwise.) Ideally—or perhaps as a matter of course—we would expect that two such editors exercising their eye-sight on a single mirror image of the archetypal copper would evidence a fairly high degree of correlation when their points were juxtaposed and added up. In fact, the editors disagree about nearly one third of the pointings possible in the three relevant plates. What may we infer? First of all, that Blake’s pointing is often so ambiguous in its appearance that there is no defining it except arbitrarily. Consequently, we may suppose that the editors tend to read these ambiguous points differently, for whatever subjective, objective, or contextual reasons. There is of course the possibility that one editor sees more keenly than another, but insofar as that may be an applicable criterion, it probably does not generally enter into differing inferences about punctuation marks. The relative daring which E displays elsewhere in some of his suggested recoveries and the conservatism evident in B’s sometime dismay at what E has so recovered may be ascribed to other causes than eyesight, not all of which are bibliographically relevant. What may be bibliographically relevant is the fact that E, in reproducing his diplomatic text, confesses to “wobbling” perhaps more than he should have in the direction of “usual expectation” when grooming Blake’s dots and digs to the periods and commas of a letterpress edition. B, on the other hand, may save himself and his readers) from a temptation to so wobble by his use of italics and semi-brackets, which allow him to print a functional reading text for a modern audience while still preserving for the scholar the underlying text as B thinks Blake etched it and which the scholar can then reconstruct at his need and leisure. The happy result may then be that B here provides a more accessible diplomatic text because he is not beguiled by his concern for modern expectations into departing from a computer-eyed rigor exercised on behalf of a consistent determination of a given appearance of a Blakean point, at least within the confines of a given context. That is the way it might have been. It does not really work out that neatly in practice, nor is there any unassailable argument in favor of its doing so. To return to The Book of Los, we may first note in passing that here (as often elsewhere) substantive disagreements between B and E can be definitively arbitrated in E’s favor: E’s “Not” (10), “organs” (113), “the floods” (122), “those” (146) are right, B’s readings wrong. Because the copy rates in the upper percentiles among Blake impressions for its finely etched clarity, a reviewer may take advantage of the invitation or challenge provided by the numerous pointing disagreements between B and E by further, if not definitive, arbitration, as a way begin page 150 | ↑ back to top into more circumstantially focusing on one or more of the sources of those disagreements. As I see them, E’s points are preferable in 11. 9, 40, 50 (after “not”), 62 (after “durance”), 83 (“tho’”), 105, 109, 125, 151, but in another twenty-odd instances of disagreement B seems to me to have read the points as Blake made them—e.g., 11. 18, 20, 58, 65, 69, 73, 112, 132, 175. At times, even in this relatively clear impression, the pointing may be seen as either B or E sees it (e.g., 80, 164, 171); at times they may both seem wrong (e.g., 117 a semicolon or colon, 123 a period). On balance, B’s punctuation looks most like what appears in the unique copy more often than E’s does, partly because B more often allows us to have or reconstruct the dot Blake seems to have made whereas E tends to opt for the commas he and his anticipated readers may feel more comfortable with, though this tendency is not so marked here as it is elsewhere. To what extent this evaluation applies to other works will be partly indicated by what I say later, but it should be noted at once that as the potential “copy-texts” multiply, so do the variant apparitions of commas and dots that dance before one’s eyes in the same place in different copies. Given the high incidence of discrepant appearances of a given point in different impressions from the same copperplate, it may well be that a second copy of The Book of Los could have sanctioned more of E’s commas and fewer of B’s dots than the unique copy warrants. Lo, what should an editor do? The answer may seem to be—whatever he wants. Both B and E remind us, in their degree, that to supply punctuation is to change it—and of course to change it is to change it. But if it’s not a clear or consensus case that the mark Blake etched is a comma or a period (as we may finally be obliged to call the indubitable dot, even where it is fairly clear that Blake did not use it that way), how can we be at all sure we are not changing his punctuation with every decision we make? Even in supplying bracketed pointings an editor is often on the brink of a misleading assumption simply because he is trying, however tentatively, to suggest a needed relationship (according to modern needs, that is) which may well have nothing at all to do with Blake’s asyntactical flow (or blockage), and, who knows, may actually interfere with a submerged rhetorical significance which a given reader might, if unaided, apprehend. A related problem which may at first worry the editor and later occur to the reader is that it is not at all clear that Blake was himself typically concerned whether his etching tool discriminated a given point as a comma or a period—whether in fact he distinguished between them either by themselves or as bases for a semicolon or colon (or exclamation). What does one finally make of those series and catalogs of epithets and names wherein half the marks are well-rounded dots and half are stabbed out in the general direction of a comma tail? Or how does one respond to a comparable series of parallel phrases or clauses which initially separate their components with a neat colon that evolves from point to point into a full-fledged exclamation mark at series end? It may be that we are being so presented with a progressive revelation of Blake’s growing emotional involvement with his text and tool—something in the manner of Henry Moore’s sculpting into his stone until the sky broke through—so that we might engage all the more vitally in the immediacy of the poet’s creative act. Perhaps. On the merely mechanical side, one may conjecture that not only does a clearly imprinted comma in a given “best” or consensus copytext look like a period in a few seemingly less preferable impressions but also that it might have been made in the shape of a period in the original copper. Peripheral hindrances to an accurate sighting on Blake’s points appear in some impressions as stray splatter, wash smudges, designing bits of vine, chaff, or pestilential blight, which, depending on where they occur, could as well be dots and commas. As noted, B’s principles allow him to supply suggested punctuation as he feels it desirable. More specifically, he supplies points where Blake had none at all or he supplies alternatives to Blake’s ubiquitous dot as he deems necessary. Besides the comparative virtues of this method as already noted, another blessing is that intrusive signs of editorial emendation are relatively minimal. But there are two main problems with the method. The first, a side effect of the virtue just noted, is that stops other than dots (or periods) will at times cry out with equal claim for ad hoc editorial attention. E.g., the interruptive semicolon which Blake will occasionally plant between a subject and verb or between a verb and its object. The second and more fundamental problem deserves iteration: if one does not know whether a given point is a comma or a period, how can he arbitrate his italics and semi-brackets into place with any comfortable degree of assurance that he is living up either to Blake’s syntactical guidelines, such as they may be, or to one’s own editorial principles? If a comma in one impression appears as a period in another (or even a dozen others), the reader may feel that he is very nearly as much “at the mercy of the editor’s judgment” in B’s text as he is in Keynes’. To some extent these problems may seem to be resolved by the choice of copytext. But other subliminal problems then begin to surface. Assuming that accidentals in Blake might indeed have some authorial significance and therefore must be presumed to have editorial significance, we may want a more exacting justification of the choice of copytext than B (or E or anyone) provides before we agree, plate by plate and line by line, that an editor has exercised his judgment in such matters to, and perhaps beyond the limit of the possible when he prefers copy O’s exclamation mark to copy P’s colon. How does one decide whether the best text, as he sees it, or the consensus text, as he arrives at it, provides him with the period he may change to a comma or with the comma he cannot change to a period? Or can one definitively wobble in such cases? And even if we agree that, roughly speaking, the latest and least colored of many impressions (assuming that that is an ascertainable choice) provides the best overall guide to accident as well as to substance, may we be sure that adherence to it in a given instance is not more the result of inertia than of requisite collation? Or, what may be worse, a perfunctory adherence to a principle of copytext selection which cannot really apply to Blake’s methods of production begin page 151 | ↑ back to top and dissemination? Given the conditions of publication, couldn’t it be that an assumed best text may in a number of clear instances be much less than best? When several impressions may have equal authority, it may well seem that a species of eclectic edition is the only way to go, however arduous a task in collation it may be for the editor and however suspect the result may seem to the bibliographical fundamentalist. B has had the unique opportunity, as he tells us, of inspecting all of the extant copies of the illuminated works. It is not so clear as it might be that he has made the best use of that opportunity from plate to plate and from line to line. In order for me to make the best use of the space available, I’d like to pin-point specific problems about pointing, as perceived and supplied by B, which will as well suggest more comprehensive problems of editorial principles and copytext. As a general rule, these specifics are representative of a host of others I’ve accumulated, but I should note that I am mainly concerned with pointing out grounds for further editorial surmise rather than with pointing an invidious finger at the bulk of B’s volumes. Lest my overall appreciation of this quite handsome and painstakingly compiled edition be lost in the shuffle of my sometimes captious highlights and comments, I should note at the outset my comparative estimate of its worth: it is on balance the best complete edition of Blake’s works currently available for both the scholar and the serious reader. Following B, I make frequent use of E for comparative purposes where his editions are specifically relevant. I also use customary or easily interpreted abbreviations for Blake’s works. MHH 8: 34 “The rat, the mouse, the fox, the rabbet; watch the roots, / The lion, the tyger, the horse, the elephant, watch the fruits.” B’s principles allow him to do nothing with the interruptive semicolon in 1. 1 but in 1. 2 allow him to remove the dot he sees before each subject, including the one separating the parallel “watch” predicate from its most immediate subject, “elephant.” The comma he supplies could have been eliminated altogether according to his principles and modern practice, though in so mediating extremes as he does he perhaps comes closer to what may be an implicit Blakean and/or rhetorical norm at this point. Of course “normative” punctuation, when aligned with one of B’s principles, could also have prescribed here the semicolon before “watches” retained above as having more contextual authority, but it would have been as bothersome to the modern reader to so supply it as is the preceding semicolon which is allowed to stand. E maintains his diplomatic credentials here (and keeps his readers comfortable) by seeing B’s dots as commas. Without moving farther afield, one may note comparable interruptive semicolons which must be retained in 6:par. 24, “When I came home; on the abyss of the five senses,” and after “confirm’d” 12:par. 32, where commas would probably have been provided if Blake had used dots instead of semicolons. The apparent assumption behind such a distinction in editorial practice is that Blake himself distinguished between semicolons and periods in parallel constructions. MHH 7:par. 24 “with corroding fires [;] he wrote . . . ” The semicolon seems arbitrarily supplied to break up a relation that Blake’s pointing suggests he meant: “corroding fires” describes the process by which the writing was done. Admittedly these are judgment calls which the brackets make rebukeable. Nonetheless, if left unquestioned they may work their way into the reader’s (or into another editor’s) mind to define a possible ambiguity that should be kept intact. Again, both E and B supply a semicolon after “shining,” 18:par. 65 (which becomes a period in the Erdman/Stevenson edition), but the only point Blake supplies in this context is the comma after “sun,” which not only separates “sun” from “black” and “shining” but also intimates that these adjectives should adhere with no further break to the “round it were fiery tracks” following, a relation warranted by the blackness which later rolls through the deep after coming from between the black and white spiders who are revolving on the tracks. In effect, the comma which Blake did supply is compromised by the semicolon he did not, and, again, modernizing editors are led to accept a syntactical relationship opposed to that which the poet not only provided, but might have meant to provide. Comparable semicolons questionably resolving ambiguities appear in Milton (M) a:22, where the semicolon after “Cherubim” supposes that the “victims” are sacrificing the Cherubim, a reading inferentially at cross purposes with M f:15, where the “Females prepare the Victims.” The comma which Stevenson supplies after “Sacrifice” seems preferable, if any point is needed. M a:4’s “Woven” is followed by a semicolon in B, while E places a period before it. A likely inference is that no punctuation would best aid the reader when editors so sparing of their points and changes differ so radically about the syntactical relation of the word. Again, even tentative punctuation becomes a species of editorializing a meaning rather than aiding the reader towards a correct understanding of Blake’s intention here. M 20:56— both B and E suppose an apostrophe after “Witnesses,” a crucial supposition, particularly since it denies Blake the comma he apparently had placed here for a usual purpose in his practice: to introduce a quoted (or implicitly quoted) statement. Taken with the fact that Blake seldom provides possessive apostrophes, such practice suggests that the mark should be read as the comma it looks like. It can then introduce the lines following (57-58) which probably should be read as the “cries of the Churches,” with or without the consequent punctuation which B perhaps misleadingly supplies. Contiguity and an understanding of Blake’s irony at this juncture will make the reading of the point as a comma preferable to some, even to more than some if the point is allowed to stand as and where Blake made it. M 3:25 and passim—Seven times in six plates Blake admonishes: “Mark well my words! they are of your eternal salvation.” There is almost no correlation among the points used in the same place from one reiteration to another. Nor does there seem to be any editorial consistency in either following or providing punctuation, with the most notable instance of such discrepancy evident in the two places where Blake does point the line the same begin page 152 | ↑ back to top way by supplying nothing at all. But B puts an exclamation after “salvation” in a:20, a period after “salvation” in 7:7. Why? I doubt whether an acceptable rationale can be found, except one based in the precedent found in Blake’s own utter lack of concern for what points he used from context to context. But to that precedent there is no end of consequences, even to abolishing altogether the need for any attempt at providing such “aids” for the modern reader. What one does find highlighted here is the previously noted limits of B’s bracketed punctuation. Since he can only provide points where there are either periods or no points at all, he must be content to let punctuation stand which he probably would not prefer if his editorial principles had not bound him to a species of syntactical inconsistency. Again, while it might have been better to have left the Notebook drafts as unpointed as Blake wrote them, the points that are supplied should probably be those that Blake used (or B supplied) in the etched versions. E.g., if B reads an exclamation (it may well be a colon) after “Dream” (1) in the illuminated “The Angel,” why not supply that inferable Blakean pointing in the draft rather than supply a comma? The likely answer may well suggest the bibliographical weakness of the principle behind it, or at least a discrepancy[e] between the effect of following the principle and of following Blake. The principle is to aid the modern reader according to his expectations in a given context. But the given context for Blake ultimately fulfilled his expectation by providing his emphasis (or syntactical division), which the modern reader must (and really does) accommodate. However, in fairness, I should note that B generally does supply in the Notebook the pointing he either finds or provides in the etched texts of the Experience poems. Thel, 88—“And says” is followed by a semicolon; in 93 “and said” is followed by a period. B can, according to his principles, bring the period into line with modern expectations by providing a colon to introduce what was said in 93, though he cannot do that in 1. 88 because Blake has, with characteristic inconsistency, introduced a comparable locution by a point other than a dot. The incongruity is apparent in contiguous contexts, but since “says” and “saids” etc. are followed by all manner of pointing passim, why bother cleaning up an occasional spot when the overall result only makes the mess left untouched all the more conspicuous? Milton 3:21 reads “That cause at length mov’d Milton to this unexampled deed” in copy A, but, as B notes, was mended in the copper to “What cause” for copies B-D. B chooses to accept the original “That” over the copper emendation and therefore supplies a period at the end of the clause, where Blake had supplied nothing at all. E, whose preference in this instance seems preferable to B’s, prefers the copper emendation and so concludes with a question mark (unbracketed). Even if “That” is preferred, it would seem that Blake’s no-punctuation at line’s end is better than anything supplied. Perhaps a comma would aid the reader a bit; the period supplied by B may obscure a connection between this line and what follows which Blake may care to intimate. M 20:7, 9—The only discernible difference between the colon B reads in 7 and the semicolon he reads in 9 is that the first may seem to have a slightly smaller lower dot (though in “B” even that distinction seems missing). As a general rule, B implicitly accepts the fuller bottom dot as the sign of the comma which makes a semicolon in such cases, though this principle, relative at best, seems variably defined and applied from context to context. Size differences between dots vary in different contexts. And the alternative criteria of rhetorical suggestiveness and modern desirability may tend to jaundice the eye somewhat so that it sees what best fits the apparent needs of a given syntax. On occasion, these inferable rules of thumb may contravene each other—e.g., the larger dot in 11 (M 20) is at the top, but B nods in favor of a modern tendency to place a semicolon before anti-thetical “but” clauses, perhaps gaining the slimmest warrant from a nearly discernible directional signal which may be protuding comma-wise from the base of the lower and smaller dot. Likewise, B (as E) has both context and modern usage on his side when he overlooks the relatively adequate comma potential observable even in copy B (more so in A) to read the lower dot as forming a colon after “remain,” 20. Both B and E regularly accept a colon whose upper dot is a bit higher on the page, and so more widely separated from its mate below, as an implicit vertical forming an exclamation mark, when the context or their sense of Blake’s rather expansive use of such tonal emphases aids at filling in the requisite part of the empty space between. E tends to opt for the shriek mark more often than B when such options are available. Witness M 20:29, where E’s exclamations are reduced to the colons which B’s copytext (and copy A as well) more nearly portray. Arguably, the “high colon” may indicate a faulty imprint which an editor is justified in filling in. Arguments the other way are obvious enough. Sometimes a slight teardrop effect becomes a vertical for exclamatory purposes when the context cries for one to modern ears—“Awake Albion awake!” (M 22:5)—however unclear it is that Blake necessarily preferred exclamations to colons in such cases—either in practice or in theory. The apt Blakean comment on a good many of these and kindred inferences from the problematically intense inane may be found in the happily unpunctuated ambiguity of “what we hope we see.” Another fairly common version of the exclamation mark is one in which the dot actually appears to be a comma. Most likely this simply means that Blake was negligent (though he does tell us that, however absurd he thinks nonsense about dots is, he knows how to make them), as he is in reverse when he provides periods rather than apostrophes to indicate elisions etc. M 12:27 provides an equivocal case in point, where a dot provides E with “earth’s” and B with “earths,” probably because the context does not require a possessive and the dot may therefore be supposed an accident. In impressions where there is evidence that the imprint of the point did not take, one may check other copies not only to see whether high colons are properly read as exclamations because the upper dot has in fact expanded to a vertical but even to see whether a healthy, fully-rounded dot in the best copies has not been partially eclipsed in its lower half so that a quarter-mooned comma tail appears in inferior impressions. M 20:19—In keeping with a general policy of begin page 153 | ↑ back to top not supplying any point at line’s end when the next line begins with a coordinating conjunction, B has none after “permanent.” E not only has a period here but provides it unbracketed, indicating that he had seen it in his copytext. Neither copy A nor B has anything here, so, if E’s reading is not a mistake, then another copy may provide what these two do not. There are of course a great many such discrepancies. And this may not be the best of many possible examples but it should serve to indicate the need for establishing a best or consensus text, even to the given point, and letting the reader know what the evidence and the reasoning are that went into an editorial preference when (apparently) equally definitive alternatives are available. Without belaboring another kind of point which may be extraneous here, isn’t the time at hand when computer calculations about Blake’s multitudinous “copytexts” for a given work and the “vagaries” of his pointing can be made, collated, and inferred from, even if the end result is at best merely a higher degree of correlation between the point preferred by the editor and the one which Blake most likely etched? “Earth’s Answer,” 7—the supplied semicolon arbitrates an ambiguity by associating “Cold and Hoar” with “I,” when it may well belong to “den” or “Jealousy.” In the Notebook draft, B supplies a comma, which may indicate some lessening assurance about what the adjectives are meant to qualify. “Does the sower?” (18) may suggest a heavy rhetorical emphasis by intruding a (rationally) redundant question mark in the midst of a sentence. It is possible—particularly if Blake etched his end-line points after he etched the text—that this rather poorly formed point was implicitly aborted when Blake realized he wanted it to go after “night” below. M 22:36—B catches a dot after “Albion” which E misses; but E notes one after “Watch-Fiends,” 40, which B misses or ignores. Always, there is the question of alternative copy texts which may justify opposed readings. The colon after “seems,” M 26:45 is so clearly there in copies A and B that one is tempted to infer that another copytext, lacking the point, eliminated it from E’s syntax. M 27:54-5—The clear dot after “Month” is apparently read (by B—E sees a comma) as if it were over the “i” of “invulnerable” below. It is really too far up and to the right to do that service, given the available option. The clear dot (read as a comma by both B and E) after “Year” provides a parallel by way of confirmation. It would be tempting, though misleading, to suppose that Blake provided periods here, not elsewhere in the series, to suggest the elision of the verb. But Blake’s pointing of any given series is a mixed bag of dots and commas throughout, with no apparent differentiating function, rhetorical or normative. (See, e.g., 27:33-34; 28:49.) In M 9:37 positioning suggests an opposite inference about a dot’s purpose. The period B reads after “Palamabron” really (as E must infer) dots the first “i” of “Elynittria” in 38. The problem is (as the second “i” demonstrates) that Blake dots his i’s with about as much consistency as he points his series. VDA 134—B’s copytext does not have the question mark he places after “lust”; it may, both in that and other copies, have the exclamation mark which E provides, but it looks most like what in context it may best be read as—a colon. In M 19:50 the barest hint of a question mark has allowed B and E to perceive it into place as the context may seem to need it, though a colon, an exclamation, or a semicolon would be more the computer’s view of the mark Blake made after “repentance.” Often the best choice may well seem “None of the above,” particularly when he has created an impossible hybrid by placing a comma under a vertical (VDA 187 provides a good example, visible even in The Illuminated Blake). M 24:15—At times B seems to make the choice Blake should have made. As E notes, it is a semicolon at line’s end, but the context of colons which make up this catalogue of parallels seems to justify B against the strict demands of the point as Blake made it, however he meant it. And does Blake mean the distinctions his editors rightly note in such cases? In M 17:46-59 passim, B and E often disagree on whether a point is a colon or an exclamation mark. Here, as generally, B is less likely to take advantage of a highly placed top dot or a slight projection from it towards the vertical, whereas E, who may after all be more sympathetic to the rhetorical demands of the sigla, is abundant with exclamations. M 17:55—Given “A,” E is preferable with a comma after “fibres,” but “B” tends to justify B’s period. M 11:40[e]—The apostrophe in “namd” which both B and E apparently saw is not really there in copies A or B, though these copies do show one over the “e” in “toned” (not recorded by B) in 11:47. Given the comparable accent to indicate a pronounced “-ed” in “used,” one may wonder whether Blake wanted the extra syllable pronounced where he did not so indicate. But a typical lack of consistency in such matters may be inferred from the “shudder’d” of M 12:33 and the “shudderd” two lines later. M 14:21—B and E agree in not seeing a comma after “everything,” perhaps because it is partly obscured by the “E” of “Eternity” below, perhaps because it separates subject and verb. Such pointing could have its rhetorical purpose. More anomalous is the comma which E places after “loud,” 14:45, but no copytext I’ve seen justifies it, nor does B confirm it. M 22:61—An atypical example of B preferring the exclamation mark, E the period, in a context where they both felt some point should be supplied. M 10:24 is more typical, where the colon B seems properly to see and place after “Jehovah thunder’d above” becomes an exclamation for E. Four lines above E agrees with B in seeing a colon after the same locution. While “Ecce signum” may be too often the cry of the blinkered textual fundamentalist, it may be at least an appropriate reminder now and then leveled at an editor prone to reading the spaces between the dots where, in Blake, contexts elsewhere seeming to demand an exclamatory emphasis are low-keyed by a mere period or even an indifferent comma. M 6:47—Both B and E read a comma here, probably because they would rather not break up the sentence begin page 154 | ↑ back to top after “Truth,” but a speculative reader straining to justify Blake’s perhaps unjustifiable practice may support the clear period the poet put here by suggesting that its purpose is to establish a kind of enclitic emphasis for “Truth” which a terminal point—particularly if it is understood as having no syntactical justification—may provide. The same inference may be applied to “Lie” in the line following. Admittedly such an inference will have a limited application and must be allowed even within such limits in the face of the conflicting and more easily demonstrable inference that Blake let his points fall into shape as arbitrarily as the chips from his copperplate defined them into dots or commas, colons or semicolons. In 27:49-51, 55-56, Blake demonstrates that he will, though rarely, place periods at line’s end before the conjunction “And” when it introduces a clause. B, who does not typically supply points in such cases, changes all but one of these to semicolons. But, while this may provide some (really unnecessary) aid and comfort to the modern reader because it falls in more neatly with modern syntactical groomings, may it not for that very reason dissipate a rhetorical intention that Blake might have felt and conditioned Blake readers may infer? Again, I do not mean this as a criticism of B on principle—we can remove his italics and restore Blake’s periods as we go—but I do suggest that where these changes or supplyings are not really necessary, where they arbitrate ambiguities better left to the reader’s discrimination of relationships, or where they may lead a reader away from a rhetorical effect plausibly inferred, they represent a dubious editorial intrusion, because they do, however tentatively, represent an editorial authority. The crucial editorial judgment involved must decide whether suggested punctuation is not misleading punctuation. VDA, 114, exemplifies the necessary contradiction often involved in trying to read Blake’s points according to the way they look. The exclamation B and E read after “O Urizen” seems more a colon in the British Museum Print Room copies but would gain exclamation status (on the principle of the high colon) in copy E were it not that the required dot at the bottom appears as a perfectly tailed Blakean comma, much more to that point than the one which makes up (for B) the bottom half of a semicolon at the end of this line. One can argue on one hand that “O Urizen” is clearly exclamatory in its tonal suggestiveness, but one must also note that Blake will in comparable passages provide alternative forms of punctuation. Here, a contextual argument could be made for the colon, though, again, Blake could as well have used a semicolon in such a context, as B’s copytext seems to indicate. VDA, 122, suggests the infinite because utterly idiosyncratic rhetorical potential of Blake’s pointing: “Does he who contemns poverty, and he who turns with abhorrence / From usury: feel the same passion or are they moved alike?” Had the colon been a period B likely would have removed it on principle. But one wonders—Could Blake have actually meant his colon here, as his dot elsewhere, to indicate a slow-down mark which would have emphasized the opposition he was setting up between the actions and passions of two quite different kinds of people? Of course here as often the point (whatever point) provides for the breathing pause the spoken lines may require. Insofar as Blake may be supposed to provide that kind of rhetorical aid, supplied and omitted pointings tend to withdraw it. M 2, 11. 9-12 of the poem—“gold” is followed by a point with a big lower dot which elsewhere B would probably read as a comma (to make a semicolon), particularly since it projects a bit of comma tail as well. But since, as B sees it, all else is colon through here, he no doubt properly goes along with the drift of the context. Even the concluding exclamation (after “fire”) is rhetorically apt (though perhaps no more than the three preceding it would be), but its top dot has little (if any) more tendency to a vertical than does the one after “unfold” above. Indeed E sees an exclamation in both places. “On Anothers Sorrow,” 27. Why supply a semicolon when the context demands, if anything, a period? But this seems another case of rhetorical and rational pointing working at cross purposes. The penultimate stanza here is meticulously effective and, one would like to hope, purposely pointed, whether one accepts B’s periods or E’s commas as Blake’s points after the parallel “Think not”’s of 29 and 31. It reads quite beautifully if the pauses of the original punctuation are observed and B’s suggested omissions ignored. The last stanza contains a dot indicating a pause after “joy,” which carries with it some of the weight on the exclamation after “O”—and then Blake rushes to the poem’s end without a point to hinder him or the reader. The run-on passage is particularly effective after the slow and balanced cadence of the previous stanza. And so one may wish away the semicolon supplied to break up the flow in 34, particularly since the modern reader could get along without it, on other grounds, as easily as he does in comparable places where B does not provide a point. M 23:20—Copy B has a clear dot after “where” which justifies B. In copy A there is nary a dot to be seen, which justifies E, who records none. Since there is also in copy B a dot below the dot transcribed by B we could assume that either we are in this copy presented with a fallen colon or, more likely, that both dots are inadvertent. In either case, the literalist of the text (copy B version) would seem obliged to note both dots as having justifiable reason for being there, or ignore both as kindred accidents. That they are likely accidents can be inferred—and this is the point—by appealing to other copies for arbitration. If the other copies supply the single dot, receive it with B; if not, ignore it with E—and with, I suppose, confirmation from our normative willingness to deny a point in a context where none is needed. (Note, however, that both copies A and B do provide a likely colon before “where,” which E and B agree in ignoring.) In another view, one may forage around enough in available copies to come up with a point which may seem better justified by modern expectations than that which exists (or does not exist) in an elected copy text. There may very well be in copy A the comma which makes a comforting appositive out of “Seat of Satan” (before “Seat”) in M 24:45 and so E is begin page 155 | ↑ back to top justified. But in copy B there is none, so B is justified in not transcribing it. As already suggested, it will not always do to let the majority of impressions of a given poem stand as the workable consensus to abide by, since it is often clear that only the minority—perhaps only one—of the impressions have received the fully definitive stamp of Blake’s copper or are free from obscuring coloration, splatters, encroaching tendrils etc., which will at times indeed seem to be just the point one may care to require in a given context. Even within the copy which seems on balance the best available a few points will be found that are less than definitive relative to their reproduction elsewhere. Out of a myriad of instances, one may note that a presumptive dot in the A and B copies of “Garden of Love,” 3, after “midst” may tail off into a barely perceptive comma in copy I but evolves more clearly in copy N, which then confirms B here in his choice of a copytext rendition that better shows it as it no doubt was on the copper. Still, one cannot therefore abide in any given set of impressions merely because some or even most will provide less obscured and uncertain pointings, since often a given plate in a relatively superior copy will come a cropper for reasons which must be ascribed to the nature of Blake’s reproductive process and techniques. One may suppose, for instance, that the many flyspecks surrounding and even filling in the gap between the colon after “regale” in “Little Vagabond,” 6, required B to confirm the point by reference to a clearer copy than N. Indeed the extraneous mottles and dots on this impression at times make the words themselves nearly illegible (cf. 11. 5-9). Again, since there really is no such thing as a text whose reliability in matters of pointing is necessarily preferable to others extant, the editor must call his dots as he sees them with a counterbalancing pair of principles variably abetted by other considerations: on one hand, the consensus reading; on the other hand, the best text—even the best impression—even the best production of a single point in a given context, where that seems ascertainable. And their fields are bleak and bare. One may perhaps argue for different rhetorical intentions in the two passages, but the argument would have to gain most of its substance from the ingenuity of its advocate, since Blake himself seems blissfully innocent of weight and measure here and quite beyond the nets or needs of rationalization. And discriminating rationale for the present arrangement of dots and no-dots could, if the pointing were reversed, find an esthetic or rhetorical application for the reader intent on binding Blake to a contrary set of insights. Besides those already noted, the following substantive and/or typographical errors should be corrected as indicated. M 27:14, for “or the Artist” read “or as the Artist”; M c:3, for “into Space” read “into the Space”; M 31, after 1. 3 insert “Towards America: India rose up from his golden bed:”; J 29:19, for “Susex” read “Sussex”; J 39:25, for “Atonements” read “Atonement”; J 45:31, for “hand” read “hands”; J p. 524 should be renumbered; begin page 156 | ↑ back to top J 77 (top of 588) for “Spirit & Truth” read “Spirit & in Truth”; J 96:34, for “rouze up: Eternal” read “rouze up: rouze up: Eternal”; VDA 6:66, for “yet their” read “yet are their”; VDA 6:73, for “and” read “&”; MHH 5:par. 19, for “were cast” read “was cast”; MHH 9:58, for “best water” read “the best water”. There are some other queries about substantives which may suggest a need for either change or further comment. M 25:53 is aptly read “The Thor” by B. Nor do I see any Blakean reason for not accepting “The” in this reference to Thor and Odin as opposed to the Gods of Priam and/or Apollo and Hercules. But since the reading has been seriously questioned by editors whose scrupulosity B praises, we should perhaps have a word noting their preference here. J 89:26 “flocks” is “Rocks” in E; again, a significant disagreement deserves a note, perhaps a justification of preference. Generally the alternatives “spake” and “spoke” are either used indiscriminately by Blake or they are all meant to be “spoke.” A word on “a” and “o” in Blake would not be amiss, since his o’s very often look like a’s when it is clear they cannot be. B generally does provide comments on E’s recoveries from apparently blank spaces or illegible blots and scribbles—often cogently, given the evidence adduced, e.g., MHH par. 20 (on “the Devil”). Blake’s caps are often hard to discriminate from his lower case initial letters—B and E often disagree about them—but when the context backs the look of the letter (consider “Stars” for B’s “stars” M 22:24) consistency is probably the best editorial policy, even if it is not often Blake’s (the “Spoke” so capped by B in M 23:43 seems much less deserving of the distinction). There is also much disagreement and perhaps some inconsistency in reading the expanded spaces Blake sometimes placed (purposely or not) between his lines. See, e.g., M 19:11, M 23:66, J 30:32, J 40:51. These are the kinds of errors and discordances which an edition of this magnitude and complexity may seem inevitably to fall victim to. It could make one wish that highly significant and ideally definitive editions such as this one could receive the kind of widespread and critical reviewing in page proofs that they will as inevitably receive once the book has passed into the marketplace. Manuscript disagreements and apparent errors are often more difficult to arbitrate because of the state of the mss, often chaotic, often palimpsestic in appearance. Notebook 49, 51 (1060B), “our” is probably “your.” 51N has some erased lines at the top which E recovers and B discounts as illegible. The recovery seems reasonable, given the equipment and persistence we know E brings to such a task, and probably should have been noted for the reader’s consideration. Both B and E read “whitlors” for Keynes’ “whitloes” on 61N (1039B). The OED lists no “whitlors” but it does note that “whitloe” (a variant of “whitlow”) means a finger tumor, which is very likely what Blake is ascribing to the poor painters he is referring to. For comparable “-es” endings see the two “theres” on this page (“alludes” on 79N is still closer); nor did Blake typically make his “r” as this one would have to be (see “Booksellers” and “Dealers” below, 61N). Since “whitlors” also appears in the Concordance, it may be that a typographical error was the original of this reading. E’s “turnd on” seems preferable to B’s “turned upon” 84N (1020B). Were it not that B’s “night” of 67N (967B) looks very much like a definite “might” at the start of this poem, both its loops and context would make his reading preferable to E’s. In 99N, E’s “opened” seems preferable to B’s “opend” (970B). In 103N, E’s “whereer” (“Holy Thursday,” 13-14) accommodates better to the number of cursive strokes available than does B’s “wherever” (976), as it better accords with the metre and with the etched version. B’s “flourishing” (105N, poem 40E), may be preferable to E’s “flaming,” but it looks to me more like “flowery” written over “flowering,” with the “hair” following perhaps mended from “head” (978B). A few lines later, no question that the “The” B queries in his footnote was deleted. However, in 106N, “his little coat” (B) seems closer to Blake’s script than “the little coat” (E) (981B). 114N’s “Dreaming o’er” (E) seems justified by the “o’er” a bit later over B’s “Dreaming of” (998). 115N, for E’s “compelld” I prefer B’s “compeld” (1001B); 116N, for B’s “Reformation of” I read “reformation by”; (1003B); 119N, for B’s “are as follows” I see E’s “are as follow” (1006B). In Vala, p. 3, 1. 12, “Individual” was accidentally omitted before “[Man del]”. V 8:6: B seems correctly to retain “fierce” and delete “bright,”[e] a decision reversed by E, who nonetheless accepts a comparable—and perhaps confirming—change in V 9:36. V 9:8 reads “Deep” (B), not “dark” (E), though the cap is doubtful. V 23:10, it is pretty clear that, as E records it, Blake meant to retain the words which B deletes. V 25:13, “the” (E) is preferable to “this” (B), as the other “The”’s in this insertion indicate. J. K. Lavater. Aphorisms On Man, page 169. Reprinted with permission from the Huntington Library. different time of composition and state of mind. On 1420 (Blake’s p. 29) the same hand sets in with comparable vehemence on the same subject. The hand recurs from Watson 35 ff. passim. I mention this in passing as a possible aid to dating. B’s supplied exclamation in “a Question [!] Downright Plain” (1420) probably separates “Question” from the words that modify it—another instance of misleading editorializing. For “Does he cast them off,” 1423, read “does he not cast them off.” In Lavater, Blake seems to have written “&c,” as E reads it, not “v” as B transcribes it (1374 and note). I tend to side with E (as against B and Keynes) in supposing that the “Admirable” on 1352 is not Blake’s, and I agree with him altogether that “No fumbler kisses” (1374) is not in Blake’s hand, so far as I’ve seen it: neither the slant nor the double-s seems characteristic. While Keynes prints both annotations in the Nonesuch edition B refers to, he excludes “No fumbler kisses” and queries “Admirable” in his later Oxford editions. There are as well a few notes and queries about the printed Blake works. Generally B accepts the changes made in various copies of Poetical Sketches, though not the “his” for “her,” “Song,” 16, 757, which nonetheless seems justified by the context, as in his Notes B seems to allow. The “ere” in King Edward the Third, Sc. [iii], 10, 1783, should probably be retained because it makes good sense in the context and is not changed in any of the copies. Whatever sanction Blake’s sometime omission of the apostrophe may provide to justify B’s “e’er” seems overruled on both bibliographical and interpretive grounds. In the “Descriptive Catalogue,” “How should he? he who,” 827 note, should probably have been retained in the body of the text for the rhetorical emphasis Blake probably meant to suggest by it. B apparently assumes a printer’s error rather than Blake’s copy for the semicolon he replaces with a comma on 832 (and note). This semicolon could have had contemporary warrant and is certainly no more anomalous than others B is forced, on principle, to retain in other contexts. A comparable change is made on 851, though, in a rhetorical piece such as this, the semicolon may be apt. Throughout B has a tendency to supply the text with questionmarks which do not, at least in their perfunctory and rational appearance, suggest Blake’s practice. 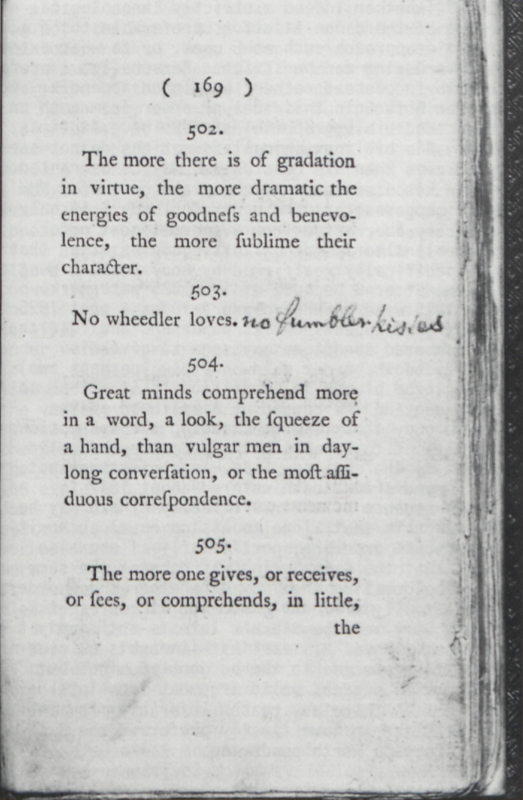 The questionmark provided on 845 could better have been an exclamation, while the change from exclamation to questionmark on 848 heavily qualifies the effect Blake seems to have aimed at with his introductory “0.” In the “marginalia” to Thornton, Blake offers a suggestive aphorism about his rhetorical practice which may well justify B in retaining in his text disagreements in number which he will (as in the “Descriptive Catalogue” errata list) elsewhere note: “The Greek & Roman Classics is the Antichrist I say Is & not Are as the most expressive & correct too.” This clarified use of a rhetorical grammar should probably be kept in mind by editors wending their way through the rational solecisms of Blake’s syntax at large. The Thornton marginalia would likely come into clearer perspective with closer study than it seems so far to have received. In a brief glance at it, I note that “but [his] / Satans / Will / who is” seems rather to be “but [his will who is] / Satan’s who is . . . ” (1516). In the “French Revolution,” the change of “war-living” to “war, living” (or “war—living”) in line 283 really has no justification and manages to dismantle an effective compound adjective in the process. B’s ordering within and among the texts may have both its problems and its merits. He must of course abrogate[e] the page order of the Notebook in order to print “The Vision of the Last Judgment,” the “Public Address,” and “The Everlasting Gospel” integrated pretty much in the order Blake probably meant for them. But individual pages within the Notebook will continue to provide grounds for a reconsideration of a given order. In this version of “I saw a Monk of Charlemaine” Blake might have meant the three stanzas on Voltaire and Gibbon to serve as a kind of integrating refrain or chorus meant to appear at different parts of the poem rather than as variants of each other best placed one after the other, as B has them. The passages seem more to gloss reciprocally or progressively rather than to replace each other, as B suggests (928 note); the 1. 7 change from begin page 158 | ↑ back to top “barons bold” to “Learning rolld” would have a valid rhetorical rather than a possible esthetic justification if such an inference were preferred. The marginal placing of the passages may indicate that Blake intended them for distribution here and there within the poem, but as B notes, there is no certain indicator of where, and it may be that any editorial arbitration other than that suggested by B would be a hazardous presumption. Still, it is worth noting that contiguity alone was all the indication Blake relied on to place comparable marginal inserts on pp. 54 and 98. B seems correct in reading the line through “For the tear is an intellectual thing” as a separation rather than deletion line. The lead-in catch phrase, “A tear is an &c,” seems to confirm the inference and the order. Another positive use of a comparable phrase appears in the insertion of the “Raphael Sublime” couplets (Notebook p. 39) after “Raphael Sublime &c” p. 1 “Public Address” (1029). It might have been preferable if B had taken advantage of yet another such cue, “Was Jesus Chaste or did he &c” (p. 54), to supply the appropriate passage from p. 48 where Blake apparently wanted it. It would probably have aided the reader if B had been more forthcoming about reorderings which may well be justified but are not obviously so—e.g., the separation of “Commerce is so far” etc. (1037) from the preceding part of its page (57), also concerned with Commerce, that B places on 1034. Other problem pages whose ordering in B may deserve rethinking include 62, 66, 67, 92. On p. 76, the context and the separating diagonal indicate that “Ishmael is Mahomet” should be placed before, not after, the interpolated “Abel kneels” etc. On p. 81, “at their head” should probably come before “little infants,” which in fact the logic of the caret and its insert suggests. “The Aged Woman is Britannica” etc. should likely follow “began,” as the final recension of Jerusalem etc. which is deleted in the margin. This does bring about the interesting but not unblakean division of Jerusalem (as the bride of Albion) into the Aged Woman and her daughter. That relatively characteristic anomaly may be preferable to an ordering which would somehow place the Aged Britannica, who is the aged wife, at her own head, since she is one of the referents of “their” in “at their head” as B (and E) receive it. I would also suggest, on the same page, that the internal logic of the description would be tighter if “The Aged Figure . . . Oaks of Albion” passage to the right of the emblem were placed after “coming in the Clouds.” Blake first describes what is above Noah, then what is around and beneath him, and finally adds the description of the “Aged Figure” who is taking account of the “various figures Risen into the Air.” The progression on p. 82 seems to support such an ordering. Blake wrote down the left side of the emblem until he could write across the entire page. I.e., he did not go first to the right of the emblem and then to the bottom of the page. B provides more or less justifiable orderings in the illuminated works which will at times make it a little harder to use his text with the Concordance and with references to the Erdman and Keynes editions. Doubtless certain of his decisions will be queried—whether he has rightly placed the conclusion of the Natural Religion plates, whether in Vala he has correctly ordered 12:26-29—whether indeed a strictly chronological ordering of the canon itself is preferable to, e.g., a thematic approach such as E uses, or to what extent such an ordering can be strict. Personally, I prefer Vala VIIb in context rather than in an appendix, and so prefer B to E in this idea of order from both an esthetic and bibliographical standpoint. At times, however, B’s bibliographical assumptions do not seem cogent, even when his conclusions may be warranted. E.g., in his discussion of the plate order for MHH (694) B supposes that the order for copy G is only a temporary aberration from a conventional order, used in all clearly authoritative copies other than G and specifically reaffirmed by copy I which must have come after G because of its 1825 watermark. But an 1815 watermark hardly precludes a post 1825 date for what appears on its paper and the fact that Blake numbered the pages may seem to give his authority to the order when only one (perhaps two) copies can be placed in opposition to it. I am not so much denying the consensus likelihood of the order in copy I as I am questioning the assumptions which attempt to establish the order beyond valid argument to the contrary. If B’s conjecture that copies G and I were both colored about 1827 is correct—because of their similarity—there may be good reason in that alone to assign equal authority to the copy G ordering, particularly if one also assumes that the G numbering was done at the same time. The question then may be whether the G order is not actually preferable because it represents what may very well be Blake’s latest—not simply a late repetition of his earliest—thoughts on ordering. One may then precede to the no doubt dubious but still, in its degree, valid argument from internal evidence: Is there any reason inferable from the text for Blake to have finally preferred the G order? Perhaps worth pondering. The congenital ambiguity inherited from the originating copper and cloned into the various impressions of a given work may at once defy and justify editorial judgments. As already suggested, such ambiguity can be as much compounded as resolved by the choice of copytext, partly because the elected text may show plate to plate variations in quality that makes an overall reliance on it at best a calculated risk. B states that he “normally” chooses his “copy texts where the etched text is clear, uncoloured, and not clarified by hand,” with specific priority given to posthumous copies because they reflect the last state to which Blake brought his coppers and can be seen “unaffected by colouring or changes of mind in the process of printing or correcting.” Since Milton copy B is neither the latest nor an uncolored copy, it is not clear why B preferred it, nor indeed is it clear, in substantive matters at least, that he typically did prefer it when alternative copies provided other readings. Generally speaking, B seems to opt for the unmended readings wherever they may appear. Although in M 3:21, copies B-D contain the mended copper reading “What” as Blake’s latest (some may feel best) choice, B prefers “That” from copy A. Likewise, to have preferred his copytext (and copies C and D) to copy A in M 24:60 would have eliminated a line which to most readers might seem necessary. However, if the erasure of the line is Blake’s, it would seem that his last intention was to omit it. A comparable—or seeming—attempt in copy B at erasing a grammatically unwarranted “s” in “sweets” M 31:46 goes unheeded and unnoted, and, given Blake’s rhetorical indifference to such matters, may confirm an apparent suspicion that other hands were at work in mending Blake’s impressions to suit another sense of propriety. Kindred mending might have changed M 23:66’s “raving” to “?roaring” in copy B, another change in his copytext which B notes but overrules. B also retains the clause which joins M 4 and M 5 in copy B, though suggests that it might have been eliminated in the copper for the latest printing in copy D. At times the crucial decision may not be so much what Blake’s last intentions were but whether or not they should be accepted as definitive. An ambiguous but well-known case in point involves the restoration of certain words in J 3 which were in the original copper but cannot be justified by an appeal to any copytext impression. B places them in footnotes, along with predictable misgivings about some of E’s recoveries in this context. It probably would have benefited the common reader and would not have discomfited the scholar if the deleted words which B accepts appeared (perhaps in italics) in the body of the text, given the enabling if not identical precedent provided by the inclusions in Milton of material later deleted. Perhaps this is the place to suggest that B’s recurrent unwillingness to be convinced by E’s confidence or certainty about his many recoveries of inferences about lost words will receive varying degrees of support from those who follow the hunt through the texts which these editors have scrutinized to see or not to see what Blake might have written. B’s caution may seem to be the ideal complement to E’s sometimes hazardous attempts at rescuing the apparently irretrievable from the outer darkness in which Blake either accidentally or purposely left it—particularly when he in turn supplements his caution by noting E’s readings of what he finds illegible. The reader will thereby know where the cruxes lie and the scholar may then attempt to resolve them when in the presence of the originals containing them. A few other problems of copytext may be briefly noted. Given the grammatical idiosyncracies of Blake and his possible precedents—and given his insistence on the exact and exacting cadences of his line—the change from an admittedly troublesome “Why have thou elevate” (J 34:10) to a more easily justified “Why hast thou elevated[?st]” should probably have been made in the footnotes, not in the body of the text. It has no textual authority, and does not seem to correct a scribal (or etching) error. As noted previously, discrepant and perhaps erroneous pointing may result from the use of a copytext which, in a given instance, is misleading. VDA, 60, does indeed have the dot after “hears” as noted by B, but, from among the several copies I’ve seen, it appears only in copy E, and may well be a splotch or anomaly peculiar to that impression alone. begin page 160 | ↑ back to top The inference is—and it is elsewhere inferable as well—that something is not necessarily better than nothing if it fails to gain representative support. VDA, 99, concludes with a semicolon for E, nothing at all for B, and, in the British Museum Print Room copies, a colon for me, one which I would diminish either to a dot or comma using only the copy E copy-text that B apparently relies on. But in this instance there is something there, though B likely overlooked or ignored it because in his copytext he could legitimately suppose that the miniscule and faded dot that imprinted from the copper was in fact a part of the rather flaky smudginess which runs up the margin just to the right of the text. A further inference: the copytext here is neither best nor can it be easily seen as representative. The indicated moral: other impressions must be checked and, where they clearly provide better readings, preferred. VDA, 165, suggests the need to look around for a “best” text for a given reading when there is some evidence that a specific or even consensus copytext may be at fault. The word “sleep” ending this line is followed by a readily discernible dot in copy E and so B accepts the point as a period. The only copy I’ve checked which clearly justifies E’s colon is copy O because it is only in that copy that the upper dot comes through with any distinction. It is otherwise faded and smudged at best. But since the “p” at the end of “sleep” likewise suffers a noticeable attrition in other copies, the editor doggedly in pursuit of the point Blake made might have been alerted to the need for nosing about for a copy which rounded out a better “p.” In copy E the “p” lacks its loop except in the merest impression, and a comparable mereness barely ghosts in the upper dot of the colon which copy O clearly defines. Admittedly, such pains may seem hardly worth the taking if the instances are supposed isolated. But in the first place they are not, and in the second place—if an editor supposes instead that Blake’s pointing does matter in its minutest particular—or even that it may matter-then he must draw very heavily on his reserves of both patience and perspicuity to ferret it out at its best or most likely. VDA, 107, suggests how infinite those reserves may have to be. If one had decided that copy O’s clear colon in 167 gave its dots a necessary priority over vacuity in other impressions—or if he had only copy O to rely on—he would place a dot after the “And” in 107, on the grounds that there is ample evidence that Blake’s pointing does not abide rational questioning. But, fortunately, copies A and B would be near at hand to provide here a void editorially preferable on every logical ground. In the long run, the problems and the contradictory solutions available for them probably exceed even a theoretic comprehension, much more any set of workable editorial principles. A significant variant worth noting because it may affect decisions about the relative dates of the Experience copies appears in 1. 4 of “The Lilly” in copy B. Whereas in copies A and T, e.g., the word “bright” at the end of the line is etched in with a left-serifed “g” in correspondence with the other g’s on the impressions, in “B” an unserified “bright” has been written into the text. If this is the only impression containing a variant “g” of this sort, there may be grounds adduced for supposing that it was also the first impression Blake made from the copper. He seems to have rubbed out the foliage encroaching on the line in which he wanted “bright” to appear in an initial attempt to get the space to accommodate it. When he found out he could not do that to his esthetic satisfaction, he put it instead in the position of a catchword below the line. Since in other copies I have seen the marginal foliage is intact on line with “beauty” (nearly touching it in most cases), it would seem that they were made after the initial trial and error of “B” had located the received positioning of “bright” under and to the right of “beauty.” On another dating matter, it seems a perverse reading of the evidence to suppose that a “clear postmark date of 28 August” 1799 on a Blake to Trusler letter “must” be a mistake because it contradicts the written date of 23 August. If there is other evidence to support this decision, we would seem to need it. Again, the contradiction between an 18 October 1791 letter and the “7” which makes up “the only really clear part of the postmark” might be suggestively resolved by supposing that the writer (Reveley) misdated the letter by one day. While the facts perhaps cannot be “reconciled” definitively, a reader could be aided towards a likely inference if he were told whether the legible “7” might have formed part of a “17.” Or he could be kept from that speculation by being told otherwise. Certain other problems of dating—particularly of possible early drafts of early poems—must probably remain forever in the realm of mere speculation, though it is difficult to believe that Blake wrote none of the texts of his illuminated works much earlier than present dating suggests.1↤ 1 See my “Thel, Thelyphthora, and the Daughters of Albion” (forthcoming in Studies in Romanticism), wherein I demonstrate the derivation of Blake’s title (θηλ means “female”) from a book advocating polygamy which was published in 1780-81. A few concluding queries. How likely is it that Blake meant to write “o’er-fired” in Thel, 29, when the word has application only to ceramics (according to the OED), would seem to contradict the sense of its context, and may well be of a piece with non-words like “sendinding” (J 88) and “Chastitity” (J 94), which B rightly emends in the text? Admittedly, B’s inferable principle in such a retention is in itself unobjectionable, but one may wish that both rational and esthetic considerations had led him to place “o‘erfir’d” in the footnote, “o‘ertired” in the text. “Anglus” may, as B suggests, refer to Robert Hunt (1051), but there is perhaps better contextual evidence in the Notebook for supposing that it refers instead to the generic “taught” Englishman who is “so used to Journeymens undecided bungling that [he] cannot bear the firmness of a Masters Touch.” Is it possible to establish in a repeatable way the precise measurements of the plates which B provides as a way of deciding which ones appeared back to back on the same copper? I do not at all call into question the brilliant work of this sort which went into B’s classic essay on the masking of America, but do find my own measurements (and Bindman’s) sufficiently at odds with B’s to create some doubt whether millimeter accuracy is attainable on a level of consensus. Is it perhaps more likely that the engimatic letters below the text in MHH 6 are “MOH” (with a possible “H” inferable as well from the blur following) rather than “WOH,” as B suggests (79-80)? That rendition would have the relevance of abbreviating the poem’s title. Finally, I note a proof-reading error, 684, where begin page 161 | ↑ back to top Exp. 50 is accorded the roman letters which belong to 51. Many readers who ponder these volumes will be variously afflicted with a certain sense of disappointment, tempered, however, with the recollection that, in terms of the editorial purposes and assumptions set forth in his introductory matter, Professor Bentley has fulfilled his promise, if not, altogether, our hopes for a fully serviceable text and textual commentary on Blake’s work. What is certain is that, in a multitude of ways, future editors of reading texts and anthologies are bound to profit from the immense labor which has gone into this edition. And its ultimate review and evaluation will only be made by the next Blake editor who sets himself the prodigious task of thoroughly retracing, in all its minute particulars, the course of many years of devoted application that has led us this far along the road to the establishment and refinement of the Blakean canon. A vast number of these particulars will only come into view and focus because of this edition—a fact that will continue to inspire the positive assessments which it will continue to receive and which it so richly deserves.